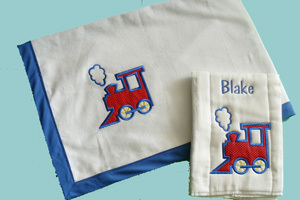 This combo set includes a bright train blanket and matching burp cloth. The blanket is a super cozy, light weight fleece with bright train applique measuring 36" x 36". A great blanket for swaddling and every day use. The only thing different on this blanket and the regular priced blanket is that the train is in a different spot. Paired with a burp cloth you have a winning gift idea at a great price. Our burp cloths are super thick, absorbent, gauze weave diapers with darling high quality appliqué. They are machine washable and are very durable. These decorated burp cloths are the perfect alternative to a plain white drool cloth for proud parents’ shoulders! They become many babies’ favorite “lovey” or snuggle blanket after the “burping” stops. Our daughter, Brooke, slept with her favorite ones for years and now our son does the same. This special promotional set is limited to the bright train design. For other designs, please see our Blankets and Burp Cloth pages.